Fireworks are a form of pyrotechnics, which are ignited to produce explosions, loud noises, and stunning visual effects. They are used for entertainment, fun, and as a part of patriotic celebrations. In the United States, fireworks are an important part of the celebration of Independence Day on July 4, and New Years Eve on December 31st. 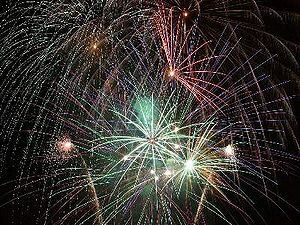 Fireworks were invented in China and brought to Europe by Marco Polo. Formerly, common fireworks intended for the consumer market were classified as "Class C" explosives by the U.S. Department of Transportation, and fireworks intended for professional displays by licensed technicians (such as those at July 4 fireworks displays) were classified as "Class B". The "Class A" designation was for high explosives used in industry and construction such as dynamite. Nowadays an international United Nations classification system is used in the U.S. with Class 1.3 the equivalent of the old Class B, and Class 1.4 the equivalent of the old Class C.
Federal law regulates the explosive content of common consumer (Class 1.4 or Class C) fireworks. Since 1966, consumer fireworks exceeding these regulations have been illegal, these include M-80s, silver salutes, and cherry bombs. A common sight in the U.S. in the 1950s and early 1960s was the roadside stand selling cherry bombs, M-80s and other now-illegal fireworks. Today, fireworks stands are still a common sight in many U.S. states but the explosive content of fireworks is much less than it was before 1966. Some states regulate fireworks sales to allow them only in the period on and immediately before July 4 and/or December 31. Some states allow fireworks sales year round. There are also some U.S. states, mostly in the northeast but also including the states of Georgia and Arizona, which ban fireworks altogether, and California only allows fireworks deemed "safe and sane" by the state government and bans firecrackers, bottle rockets, and other fireworks that don't have the state government's approval. All of these regulations are often cited as examples of the nanny state restricting personal freedom in the name of "protecting the children", "fire prevention", "safety", etc. Weingart, George W. Pyrotechnics, 1947. A classic reference book on fireworks of all kinds. This page was last modified on 27 June 2016, at 17:51.